We take pride in our tradition of quality food and great service. Since opening our first location in 1978, we have always served homemade family recipes made every day with the freshest ingredients. From our original Puffy Taco recipe and technique to newer menu items being created, for generations we have strived to be the best at what we do and are rewarded by satisfied, happy customers that become part of our Henry’s family. Henry Lopez started his restaurant career at the age of fourteen working for his eldest brother Ray at his restaurant, Ray’s Drive Inn, in the1950’s. It was at a young age that Henry dreamed of opening his own restaurant. While working alongside his brother, they experimented with many deep fried food items. One of those experiments was deep-frying corn “masa” dough finding that it puffed up. They then stuffed the fried dough with ingredients and called them crispy tacos. About 8 years later, Henry and his brother Louie opened their first restaurant called El Taco Food to Go. It was there that they sold the puffed fried corn “masa” dough, also calling them crispy tacos, along with other family dishes. El Taco Food to Go was one of the first pickup windows for fast, easy take out in the inner city of San Antonio. After a few years in business, Henry bought out his brother but eventually closed his restaurant due to street closures for drainage on Zarzamora street. Henry moved to California and it was there that he saved money, revamped his original El Taco Food to Go concept and planned his future of returning to San Antonio to live out his dream. His dream was to open a restaurant and specialize in the puffed fried corn masa tacos he renamed “Puffy” Tacos. In 1978 he opened Henry’s Puffy Tacos Mexican Restaurant. Although there were only 8 tables in the original 900 sq. ft. building, this restaurant became very popular in the neighborhood and throughout San Antonio. Henry’s wife and children joined the family business and together continued to sell the extremely popular Puffy Taco invention. Continuing to gain popularity, Henry’s Puffy Tacos moved through three different locations in order to continue to accommodate it’s growing following. There are now two restaurant locations with Henry’s Puffy Taco Express back in the original location. “Henry” the Puffy Taco mascot was created in 1989. This now famous mascot is a permanent character of the San Antonio Missions minor league baseball team. He is also seen around San Antonio helping nonprofit organizations and making appearances, including being crowned as the “Chips King” of Chips N Salsa, an official Fiesta event. Through word of mouth, Henry’s Puffy Tacos and its namesake mascot have gained nationwide attention having been featured in Texas Monthly, Southern Living, The Wall Street Journal, New York Time magazine, Sports Illustrated, Rachel Ray and Martha Stewart. Among a variety of family recipes, Henry’s Puffy Tacos currently sells over 1,000 Puffy Tacos a day and has sold over 15,000,000 Puffy Tacos to date offering eight different fillings and numerous toppings. The spicy beef fajita gained national recognition by a compilation of food critic reports as one of the top “best tacos” in the United States. 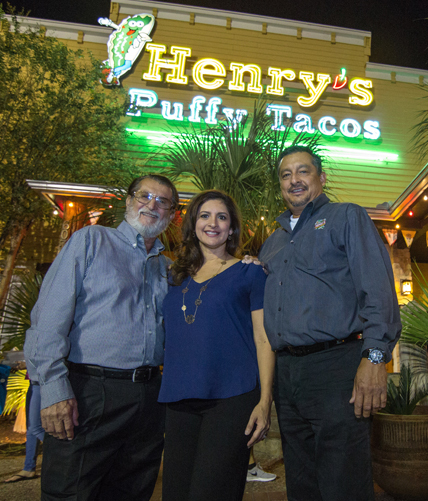 Henry’s Puffy Tacos takes great pride in sharing the Lopez family dishes for all to enjoy and over the years has donated their time and finances to help support the growing community of San Antonio. Through hard work, dedication and the love for their business and customers, the Lopez family has established Henry’s Puffy Tacos as a San Antonio Icon.